The hood emblem on the 9-5 is attached with foam tape. There are three pegs on the back of the emblem that sit loosely in three holes on the hood. Fold the shop towel over the blade of the screwdriver to protect the car’s paint from scratches. 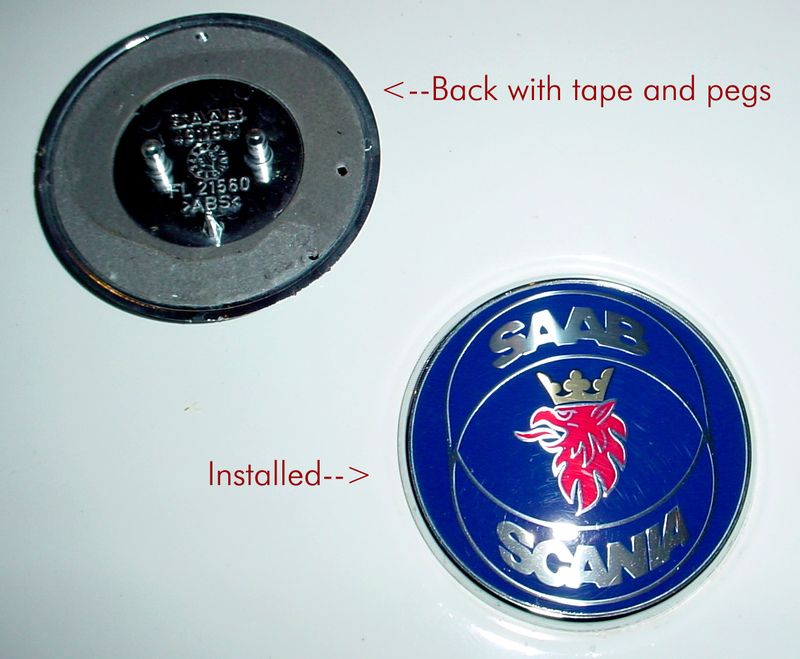 Inspect the edge of the emblem and find the spot that looks best for wedging the screwdriver under. The best technique is to press the screwdriver blade under the emblem slowly (not too deep at first) and then bunch a little of the excess rag between the hood and the screwdriver to form a sort of fulcrum to help put more leverage into your prying with out damaging the paint. The foam tape under the emblem should start to rip loose. Slide your “screwdriver lever” over and continue to pry, slide, pry, slide, pry, like an old style can opener. Take your time on the sliding and prying. At some point you can stop prying with the screwdriver and just pull the entire emblem off with your fingers. There will be some foam tape left on the hood. It’s tenacious stuff and you will want to really get it all off before you stick down the new emblem. A combination of WD-40, razorblade, and paper towel will eventually clean the emblem divot. Follow it up with some rubbing alcohol to get the surface ready for the new emblem. Without removing the paper backing on your replacement emblem, place it in the spot and see how it will line up. It might even be a good idea to do a few practice runs to make sure you are comfortable when the time comes to really stick the emblem on. I placed my ring and pinkie fingers against the hood to help steady my hands and used my index fingers and thumbs to hold and line up the emblem. When you are ready, remove the backing, reset yourself to your previous dry run position and, in a slow and even motion, set the new badge. Press firmly all over the newly seated hood emblem to make sure the foam tape makes contact with the hood. Clean up the work area and then step back and admire your work.